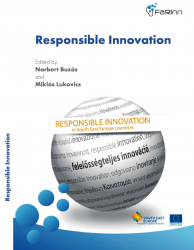 Buzás, N. – Lukovics, M. (eds) 2014: Responsible Innovation. SZTE GTK, Szeged, pp. 13-27. In this paper, we present the results of a study conducted with several major actors from the French financial industry, which aimed at developing a process for developing responsible innovations by deploying a Design Thinking method. We begin by presenting the context for the study which includes a brief description of our approach for understanding and exploring the issues raised by responsible innovation. This first part also includes a comparative analysis of the characteristics of RI (responsible innovation) and wicked problems in order to establish a potential link between the two concepts. Secondly, the Design Thinking method is introduced as a potentially suitable approach for addressing wicked problems and thus, RI. Finally, the process for developing responsible products and services which was developed throughout the study is presented.